Penn State World Campus appears in our ranking of the Top 10 Psychology Degrees Online (Bachelor’s). As an official campus of Penn State University, students attending Pennsylvania State University World Campus can choose from more than 150 degrees and certificates offered completely online, including a variety of programs in psychology and counseling. Because Penn State World Campus is backed by Penn State University, students have the benefit of knowing that the courses and faculty at the world campus meet the same quality standards as those at the physical campuses. Penn State World Campus offers an A.S. and B.S. in Human Development and Family Studies, giving students the education and training necessary to work in marriage and family counseling centers, drug and alcohol treatment centers, nonprofit organizations, and service agencies serving children, adults, and elders. Other undergraduate options in counseling and psychology are a B.A. and B.S. in Psychology and a B.S. in Biobehavioral Health. The university also offers undergraduate certificates in adult development and aging services and an undergraduate minor in rehabilitation and human services. Graduate degree options include a Master of Professional Studies in Psychology of Leadership and a graduate certificate in applied behavior analysis. 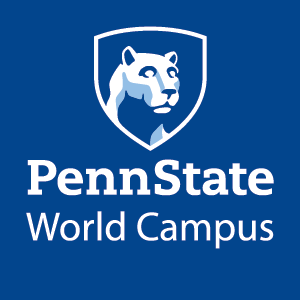 Students enrolled in the World Campus interact with classmates and instructors through Penn State’s Canvas Dashboard. This allows students to send direct emails, collaborate with classmates for group projects, and share ideas through discussion boards. While courses have specific deadlines for assignments and tests, students can work at their own pace throughout the day to meet those deadlines. Penn State World Campus offers the world’s first fully online chapter of Psi Chi, a club and honor society for psychology majors. The World Campus uses video conferencing, social networking, and newsletters to connect members around the world, providing the same networking, support, and internship opportunities that students attending a physical campus would receive. In addition, students enrolled in the World Campus can also participate in on-campus events and activities and have the opportunity to attend commencement on campus. Penn State World Campus is the second largest campus established by Penn State University, which is also known as The Pennsylvania State University System. The World Campus currently has an enrollment of approximately 20,000 students studying in over 150 degree and certificate programs. The campus has been designed particularly for non-traditional students: adult learners who are currently working or raising a family, military members and their families, and those who are otherwise not able to attend a physical campus to study. Penn State University was established in 1892, with the World Campus launched in 1998, making the World Campus among the first online campuses in the world. The university established the online campus to help students who were not able to attend classes on campus receive a Penn State education, and today their student body has expanded around the world. Penn State University is accredited by the Middle States Commission on Higher Education. Because the online courses are the same courses and use the same curriculum and faculty as the physical campus, all World Campus courses are also fully accredited. All prospective students seeking admission into Penn State World Campus must first be a high school graduate or have completed their GED. Students complete an online application and are also required to submit a Self-Reported Academics Records (SRAR) form. Applicants will receive their decision letter four to six weeks after all application materials are submitted. Application deadlines are based on the student’s desired start date. Applications must be submitted by June 30th for fall admission, October 31st for spring admission, and March 15th for summer admission. New students should also complete their FAFSA by March 1st. Students wishing to study psychology must first enroll in the College of Liberal Arts and complete Intro to Psychology, statistics, a social and behavioral science course, and a general quantitative course. Following successful completion of these courses, students are able to declare a major and be admitted to the psychology program. Typically, students enter the undergraduate psychology program with 25 or more credit hours in core and general requirements completed. Prospective students in the Master of Professional Studies in the Psychology of Leadership program must already hold a four year degree. Applicants must submit an electronic application, along with official transcripts from each institution attended. All students are expected to have a GPA of 3.0 or higher and a minimum of two years of paid full-time work experience prior to applying to the program. Students with a GPA lower than 3.0 will be evaluated for admission on a case-by-case basis. Applicants are also required to submit contact information for three references, a resume, and a two to three page statement of purpose highlighting the applicant’s career and educational goals. The application deadline for fall admission is July 15th, for spring admission is November 15th, and for summer admission is April 15th. Tuition for the Penn State World Campus varies based on the number of credit hours taken. For students who have completed 59 or fewer credits and are enrolled part-time, tuition is $555 per credit hour, while full-time students pay $6800 per semester. For those who have completed 60 or more credits, the tuition rate is $596 per credit hour for part time students and $7,300 per semester for full time students. All enrolled students also pay a technology fee each semester, ranging from $86 to $252, and is dependent on the number of credit hours. Students attending the World Campus are eligible for the same federal and school-based financial aid as are students attending one of Penn State’s physical campuses. Scholarships are also available specifically for World Campus students, including scholarships for first-time or returning students, military members, and adult learners. These scholarships are highly competitive and all current students are eligible for consideration. Students complete a single application and receive consideration for all forms of financial aid for which they are eligible. For more information about the online psychology degree options, please see Penn State World Campus’ College of Liberal Arts and Communication website.